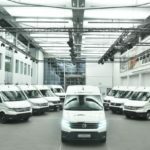 The all-electric van from Volkswagen Commercial Vehicles, the eCrafter, will be making its UK debut at the Commercial Vehicle Show at the NEC in Birmingham from 24-26 April, ahead of real-world testing beginning with UK customers at the start of May. The first test vehicles were handed over to a group of major European customers at Volkswagen Commercial Vehicles’ headquarters in Hannover in December. By allowing the vehicle to undergo tests with selected fleet operators, the company will be able to incorporate findings and learnings into the final design and production version of the zero-emission van.